The Christmas season has finally arrived, and this year cinema has gifted us with an animated recreation of the original How the Grinch Stole Christmas. 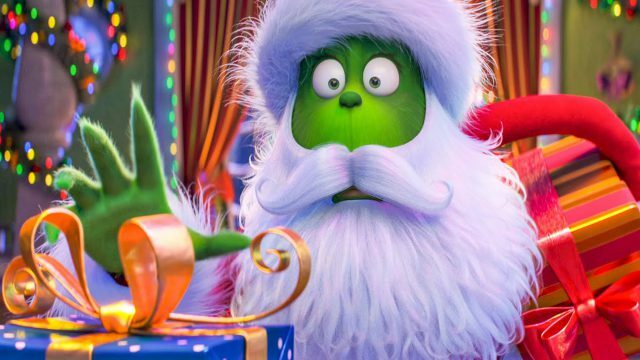 The Grinch hit theaters on November 9, 2018, which gave audience members the chance to start their holiday celebrations early this year. Running at just under two hours of screen time; this holiday classic retells the story of why the Grinch hates Christmas. 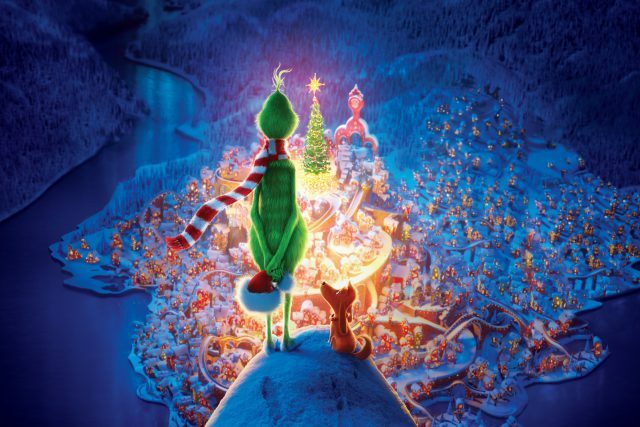 The Grinch (voiced by Benedict Cumberbatch) lives in solitary alongside his loyal dog, Max, at the peak of Mount Crumpet. His character is described as having a heart that is two sizes too small, and once the story progresses we begin to understand the stigma around his sour personality. Or maybe, after all, we learn he is just a misunderstood soul? Taking a different path from the original storyline, the script provides a different take on his hatred for Christmas. Hearing the carols sung by the people of Whoville brings back unwanted memories of his childhood as an orphan. The Grinch wanted nothing more than to receive gifts and visitors during this most special time of the year. 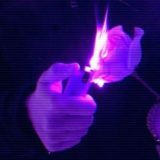 Upon receiving nothing year after year the fate of his bitter heart was due to heartbreak. Just down the mountain are the Whos busily preparing for a larger than life celebration of Christmas. This year the theme was “the bigger the better,” which leaves the town going to extravagant measures to decorate Whoville accordingly. Among the Whos is little Cindy Lou (Cameron Seely), who this year has a wish much greater than herself. 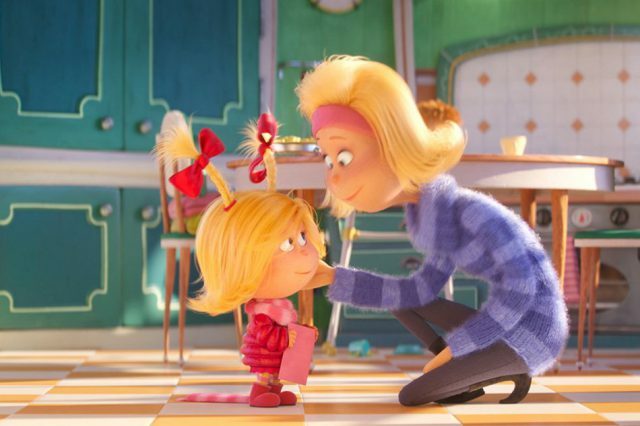 Designed as the character who will show the Grinch the meaning of Christmas, her gentle soul is seen as what the movie needed to pull on your heartstrings. 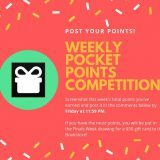 This year Cindy Lou’s request is simply for her mother to receive some acknowledgment for all she does for their family. A letter to Santa will not do the job, so she devises a plan to trap Santa when he delivers the towns presents on Christmas night. Back at Mount Crumpet the Grinch is devising a cruel plan of his own to put an end to Christmas once and for all. His plan is to steal Christmas, and he will do so by stealing all of the decorations and presents in Whoville before the sun rises on Christmas day. The Grinch schemes his master plan with Max by creating gadgets to help his sinister stealing go by smoothly. He disguises himself as Santa Claus by recreating the classic outfit after researching it with his official Christmas guide. With his outfit and his gadgets complete, the Grinch sets out to assemble his sleigh and recruit some reindeer. The comedic timing of him finding one rather large reindeer named Fred to join the team was a favorite moment among audience members. Although ultimately the Grinch had to rely on his trusty companion Max to guide his sleigh that night. As the night went on the Grinch had almost successfully completed his mission to steal Christmas. He had reached the last house of the night, which just so happened to belong to Cindy Lou. Cindy successfully trapped the Grinch and was able to explain her Christmas wish, which softened the heart of the Grinch. It was at this time he realized the true meaning of Christmas after all and wanted to restore the Christmas cheer he stole from Whoville. A classic Christmas tale rebooted to show a journey full of laughter, friendship, and the power of kindness. This movie offers a simple take on a wicked heart that turns to see the error of his ways, and another successful Christmas in Whoville after all. All photo rights belong to Illumination Entertainment and Universal Studios.